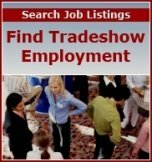 Hiring a tradeshow magician is one of the many ways to build booth traffic and separate your company from others on the exhibition floor. At a show, you not only have to compete against other companies that are exhibiting, but also you have to compete against all the attention-grabbing strategies they use. One thing that really draws a crowd is a crowd. If you want to build a small crowd that grows larger, consider hiring a magician for your booth and see how magic works on people. It is irresistible. Even better, a good trade show magician understands his or her role on the floor and works for you to build an interested, feel-good crowd. If you are planning to use a tradeshow magician to draw a crowd (and it will), then you need to go one step further. Just doing magic that will be attract visitors to your booth is not enough. You have to have a plan. There are two things you have to do to make having a tradeshow magician not just a good strategy -- but a great one. First: You have to find a way to engage people during or after the magic to find out who they are and if they are viable prospects. Look at your booth layout, train your staff and create some sign-up tools. In some way you have to take advantage of the fact a large crowd has stopped at your booth. Second: Ensure that your key marketing message is incorporated into the magic act. Trade show magic is not really about entertaining people, although good magic does just that. People in good moods are easier to approach and build rapport with. This is a chance to take advantage of having a larger group hear your key marketing message. This works especially well if your trade show audience is as laser-focused as your target market. For example, if your target is dentists, and you are at a dental convention, you don't need to spend much time qualifying to discover if you have a dentist in front of you or not. But if you are at a technology show, you may be talking to anyone from the vice president to a programmer so you need to find out who they are and whether they represent potential leads. So take this chance to get your message effectively communicated to your audience. A special offer at the end will help deliver results. So spend the time before the show during your planning to use trade show magic to go to the next level. This article was written by Mitch Tarr, a tradeshow marketing expert and author. His website is tradeshow-marketing.com.